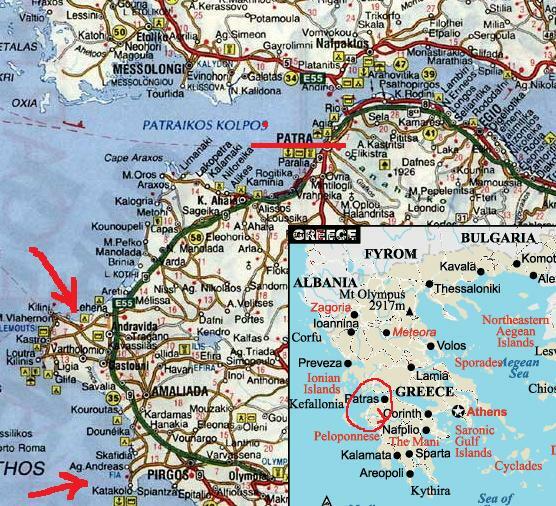 On Tuesday, July 22, around 2 a.m., “indignant citizens”, nationalist thugs that is , assaulted Afghan workers at the district Sotiras or Kouskouni near Areopolis in Lakonia Prefecture, Peloponnese. According to the police report around ten people wearing hoodies broke and entered in the Afghans’ house and beat them with clubs. Then they fired a gun on the air and left with their cars. Four Afghans were taken to the Health Center of Areopolis and Sparta Hospital, and were allowed to return home in the afternoon of the same day. The police mentions some small dispute the Afghans had with Greek locals in the previous days. This is the second major racist incident in Sparta in the last months. On February 5 2010, a group of 13 adolescents 14-17 years old set the house of Banghladeshi workers on fire. The workers who were sleeping inside took notice of the fire in the last instance and managed to escape. The young arsonists posted on the web the video they had shot with their cell phones some hours later. adaptation of this enet article. Text in Greek available here. For people in Greece, though, the announcement of the Secretary for Home Affairs Theodora Tzakri two weeks later, which made clear that Greek citizenship would be granted only to children born to legal immigrants, came as no surprise. The doctrine of “Zero tolerance to illegal migration” goes hand in hand with this government’s humanitarian turn… As for what this turn is all about, it aims at incorporating immigrants mostly from Albania, after two decades of overexploitation, and in exchange for votes. A phony exchange indeed. Along with this, the dividing of immigrants into ‘good’ and ‘bad’, ‘useful’ and ‘superfluous’, ‘legal’ and ‘illegal’ becomes more intense, and the system of exploitation grows deeper roots . “The aim of developmental policy is to control migration flows (through the FRONTEX patrols and detention centres) as well as to regulate them (through 5-year rotating work permits, the annulment of asylum rights), in order to keep a stable proportion of productive inhabitants within the increasingly ageing, unproductive populations of Europe. In other words, recycling the migrants will keep the indexes of development in check, development being the systematic and bloodthirsty pillage of lives and resources, time and space. According to the “UN Population Division report on replacement migration”, if the Europeans want to keep their ratio of older people to active workers at the 1995 levels, the Union will need 135 million immigrants by 2025. This demographic issue is only part of the story, and maybe not the most important. Neoliberalization inside Europe has meant a weakened, destabilized labor force. It’s not just that capital wants selected migrants because it needs more workers, it wants migrants because they are powerless, unorganized, low-paid workers for whom there will be no job security, no health care and no pensions.In other words, they are far cheaper and less troublesome workers”. Illegal immigrants are necessary because through them the rights of the legal ones are suppressed (there is of course rotation of people in these roles). At the same time, illegal immigration helps governments maintain a useful xenophobic atmosphere to impose authoritarian policies. “Migration management” includes both authoritarian hysteria and humanitarian logistics. The two seemingly opposite positions are the two sides of the same coin of subjugation. The new doctrine was introduced by Minister of Citizen Protection (= Public Order) M. Chrisochoïdis on Tuesday, December 15, at his meeting with the FRONTEX Executive Director J.Laitinen. The construction of the Southeast Mediterranean FRONTEX Headquarters at the U.S. base of Aktion or at Piraeus has been a permanent request of the Greek government, which proudly stated that 75% of illegal entry arrests at the sea borders of EU for this year took place in the Aegean sea. 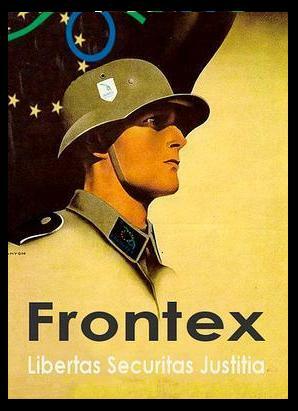 A few days earlier in the frame of FRONTEX operations (on Saturday, December 12) officers in Samos island, on no notice whatsoever and violently, carried out with utmost secrecy the transfer of over 85 Afghan refugees from the local detention center to the island’s airport at Pythagorio. There the refugees were boarded on an airplane which departed for an unknown destination. In less than two months, 16 migrants have died in the icy waters of the Aegean. Most of them were children. On Tuesday, October 27, 8 immigrants, three adults and five children, drowned in the east part of the Aegean Sea. On Saturday, November 7, the lifeless bodies of six children from Palestine, aged 2 to 12 years, washed up on shore near Bodrum (Alikarnasos), Turkey. The boat in which 19 Palestinians – half of them children – squeezed themselves on an effort to pass from the Turkish town of Turgutreis to Kos island overturned 500 meters from the shore. On Friday, December 11, a boat carrying undocumented migrants sank near the island of Leros. Fishermen found 25 migrants perched on a rocky island and two more lifeless bodies in the sea. In the afternoon of October 22, immediately after the visit of Secretary of State Vougias the detention center in Pagani of Mytilene, police officers responsible for guarding the center abused and beat prisoners, including a 17-year boy, who was evacuated to the Vostanio Hospital, where lesions were diagnosed on his head, back, waist and arms. According to the interpreter, the police promised 350 euros to the victim to buy his silence. On the 19th of November in the afternoon a 35-year old immigrant was beaten by two officers serving at the infamous Aghios Panteleimonas Police Station in Athens. Her two year old child witnessed the beating and the arrest, and along with her mother remained under custody at the Kypseli Police Station for four hours! The incident became known only because the woman is married to a famous Greek musician. On Friday, November 20 , immigrant detainee Mohammed bin Taher collapsed in the courts of Evelpidon street in Athens. His condition was such that he was taken to hospital by ambulance. As reported by the his fellow detainees (and he later confirmed) Mohammed bin Taher had been savagely beaten by police at the Omonoia Police Station. On the 9th of October Mohammed Kamran dies after the treatment he received by the policemen who had raided the house where he and fellow Pakistani workers resided in Nikaia, Athens. The para-state mechanism was launched last summer against immigrants and since then it has been working relentlessly despite the supposed change of policy. The most recent incident was the attack of last Tuesday, December 15, against the Social Haunt – Immigrants Haunt in Chania, Crete (hometown of the former Minister of Public Order Markoyannakis). In the same city on December 8 there has been a savage criminal attack against two immigrants by unknown perpetrators. The near-killers attacked the immigrant workers in the back with crowbars, and left them with serious head and body injuries. One of the 2 victims was among the 15 hunger strikers of last year , who shook the island of Crete with their proud struggle. 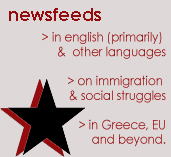 The intensity of the attacks in Chania definitely is related to the dynamic struggles of immigrants in the city. In Athens, brutal attacks against Arab shops took place at the Neos Kosmos district on Monday, November 22, when 40 people holding crowbars and molotov cocktails attacked and injured the employees in two mini-markets, destroyed the merchandise and stole the money of the cashier. Para-state organized violence encourages and feeds the diffuse social one. Thus, on November 8, four immigrants who had been working at olive fields in Messolongi, Western Greece, were attacked with crowbars and clubs and beaten savagely by circa 15 people. The immigrants were transferred to the emergency dept. of the Messolongi hospital. The immigrants had been asking their wages from the owner of the fields in which they had been working. They were ambushed and beaten in an old warehouse, where they had an appointment with their employer to get their money. In many cases there is inadequate lighting, ventilation and heating (…) At virtually none of the premises visited have the possibility to go outdoors on some yard. Even in detention centers where there is an adequate yard, the large number of detainees on the one hand and the lack of personnel on the other allows usually only for some prisoners to have outdoor breaks for a minimum period and not on a daily basis (…) Food in many cases is inadequate, the quantity and quality in general varies (..). The care taken for sanitation and hygiene conditions varies from inexistent to inadequate (…) The availability of medical and nursing staff is poor and at all cases occasional (…) The detainees were in total confusion regarding their rights, the time of their detention and ill-informed as to asylum procedures; interpreters were not available. 41 undocumented immigrants from Iraq, Afganistan and Palestine were arrested the night before yesterday in Ileia, Peloponnese (the prefecture which lays next to Patras’ prefecture in the south). They had paid 1,000 – 1,5000 euros each to be transported by a little fish-ship to Brindesi, Italy. After the ship-owners abandoned them at the shore at the Katakolon area, they tried to hide but were reported and arrested. In the first case on August 6 an asylum seeker from Afghanistan was prevented from some Greeks to pass through the square and when he asked them the reasonhe was attacked by at least ten of them, who immobilized and beat him, and then left him unconscious on the street. The local police did not register the event but referred him to a hospital where he remained the following day until dawn as his injuries were severe. He returned to the police station where he was deferred twice from filing a complaint. After this the victim with the legal advice of the Council of Refugees filed a lawsuit in Athens Prosecutor. The more recent case is the one of an Afghan of recognized refugee status who has been receiving the last two weeks daily pressures and threats to close down his shop «so that foreigners stop gathering there». On August 17 about 10 people started hitting the window of the restaurant and told him to shut down; he refused, called the police for help but the police never came. He was forced to close his shop, since the threats were repeated, and the police never came on the spot. An Afghan immigrant was produced by ambulance to the emergency wing of Evangelismos hospital, having been heavily injured yesterday at 8.30pm on an attack at Attikis square. He suffers several injuries throughout his body and has been pierced with a crowbar beneath the heart! He was attacked by a gang of fascists who patrol every night in the area. The standard, daily gathering spot of the fascist gang is just 30 meters from the Police Department of Aghios Panteleimonas. It is obvious that the contract between the fascists and the minister of public order involves daily patrols of thugs who stab and beat immigrants. In the summer many immigrants have been produced to hospitals according to the UN High Commissioner for Refugees. Sunday 12th July, at 5 o’clock in the morning, the Greek police and army commandos have entered the camp of Patras, destroying and setting fire to everything. The migrants had built this camp in 2002, and since then thousands of people had found refuge there. Here lived Iranians, Iraqis, Africans, but mostly Afghans fleeing the inferno of war. The destruction of the camp was decided by the Greek government in April, although this violated the Human Rights and was legally prohibited by the Geneva Convention. Mustafa, a young resident at the Afghan camp, phoned me in tears telling that at 5 in the morning the police entered with bulldozers in the area, but, realising that the boys had no intention of leaving the only place that had left, began to threaten them by saying that they had permission to shoot if their orders were not obeyed. As this threat proved entirely ineffective, the police began to set fire to the shacks. Once they exited the camp, the boys were immediately arrested. They were one hundred in all: 60 of them were transferred to prison in Komotini, while the other 40 have been deported to a town on the border between Greece and Albania. Among them two boys, Najib Haidari and Saeid Mustafa, were certainly among those who were able to appeal to the European Court. Yet Mustafa, during the same call, said he was scared because 240 people had already been deported in the days before the destruction of the camp, first to Turkey, Istanbul, and from there many were deported to Afghanistan. Najib and Mustafa were in possession of a document sent by the European Court in which it was expressly declared the prohibition to touch these people. When the guys showed the document to police officers, they just answered that the document was written in French and therefore it was valid in France, not in Greece. So one wonders: who is responsible for the protection of these boys? The UNCHR? The European Union? Nobody in the world? If the Geneva Convention and Human Rights were respected these people should be protected from the violence of the Greek government, and they are all still there, those who fled, those already on the way home, condemned to death by a state that passes this sentence only for immigrants. Ambasciata di Grecia presso lo Stato Italiano Via S. Embassy of Greece to the Italian State. Amnesty International is calling on the Greek government to ensure that around 100 people who became homeless after being forcibly evicted from their makeshift homes in Patras on 12 July 2009 are provided with immediate emergency relief, including shelter, water and access to medical assistance. The government should also ensure that all victims of the forced eviction are guaranteed the right to an effective remedy and receive adequate alternative accommodation and compensation. In the context of its long standing concerns that the treatment of irregular migrants, asylum-seekers and refugees in Greece violates international standards, Amnesty International is also urging the authorities to provide access to fair and satisfactory asylum procedures to the individuals evicted from the campsite and those arrested during and following the operation who wish to apply for asylum including full procedural safeguards. Amnesty International also calls the authorities to ensure that the deportation procedures initiated against the irregular migrants arrested during and following the eviction operation are in accordance with due process of law and include procedural safeguards, including the ability to challenge individually the decision to deport; access to competent interpretation services and legal counsel; and access to a review, ideally a judicial review, of a negative decision. The campsite in Patras has been occupied for some 13 years, most recently by approximately 300 people of Afghani origin including asylum-seekers and irregular migrants. A significant number of these individuals were minors, many of whom were unaccompanied. In breach of international law, people were forcibly evicted from their homes without adequate notice, any prior consultation with the community, due process of law including access to legal remedies, and provision of adequate alternative accommodation for many of those who were evicted. Forced evictions violate a range of international and regional human rights standards to which Greece is a party, including the right to adequate housing. Evictions may only be carried out as a last resort, once all other feasible alternatives have been explored, and only when all appropriate procedural protections are in place. All persons, irrespective of their legal status, must be guaranteed protection against forced evictions. The afternoon before the evictions officers from the Patras police force are said to have orally informed some of the individuals living at the campsite that their homes would be demolished the following day, but no official notice of the order was given. The makeshift dwellings were demolished from 5.30am on 12 July in an operation carried out by the county administration, the planning authorities and the police. According to reports many people were not provided with adequate time to remove all their belongings and that day the authorities also refused to show the order of demolition to lawyers representing a non-governmental organization working for the rights of refugees and migrants in the city of Patras. Thus, many people lost their belongings as a result of the demolition and also of a fire that broke out during the demolition. The Police Directorate also documented several asylum-seekers of Afghani origin holding documentation proving they had applied for asylum. This number included 23 people who stated that they were homeless and who were subsequently provided with accommodation in local hotels; 15 people of Afghani origin with no papers who were arrested and detained as irregular migrants; and 14 more migrants from various African countries with no papers who were arrested and detained during the same day in different police operations. For all of those arrested, deportation procedures have been initiated. Currently, however, there are reported to be some 80 to 100 individuals evicted from the campsite who are homeless and living in fields close to Patras without shelter or access to water, sanitation and medical assistance. Among those left unprotected are said to be a small number of unaccompanied minors. Under international human rights standards, Greece is obligated to ensure that evictions do not result in individuals becoming homeless or vulnerable to violations of other human rights. Early last year, Amnesty International had expressed concern over the welfare of a large number of individuals then living at the Patras campsite when they were threatened with eviction following a decision by the planning authorities to demolish their makeshift homes in December 2007. The evictions did not take place at that time as the planning authorities accepted an appeal lodged against the order of demolition. The current operation comes against the backdrop of a series of moves by the Greek police across the country in the past few months which have seen many irregular migrants arrested, detained and deported back to their countries of origin. In recent months the Patras police have reportedly carried out three such operations at the site where the demolition took place, arresting between 40 and 50 people each time. As a result the number of those living at the site is said to have fallen from a rough estimate of 500 people in May this year to the 300 individuals said to have been living there prior to the evictions. 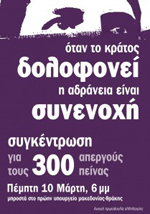 Amnesty International is requesting additional information on the eviction from the Greek government including on what measures the government will take to ensure that all those who were forcibly evicted are guaranteed their right to an effective remedy, including adequate alternative accommodation and compensation for all losses. Amnesty International is also urging the Greek authorities to ensure that the reported 80 to 100 people left without shelter are provided with emergency relief, including shelter, access to water and medical assistance. Specific measures should be taken to identify and protect the unaccompanied minors said to be among this number. Furthermore, Amnesty International reiterates its position that the Greek authorities should only ever detain migrants as a measure of last resort, after justifying in each individual case that it is a necessary and proportionate measure that conforms with international law. Alternative non-custodial measures should be the preferred solution and should always be considered before resorting to detention. Recognized refugees and migrants with a regular status should never have their rights to liberty or freedom of movement restricted for immigration purposes. CAIRO — Many Afghans, young and old, are forking over their life savings to be smuggled into Europe in pursuit of a better life away from the death and destruction plaguing their county. “People can’t find jobs here,” Abdul Ahad, 26, told the New York Times on Sunday, July 5. Abdul Ahad was laid off from his full-time driving job and forced to take the only work he could find: a once-a-week driving gig through a dangerous Kabul territory. In the past eight months, a suicide bomb and a firefight nearly took his life. He began scouting potential smugglers to take him elsewhere in the world, where he hopes to find a life. He is one of many Afghans who gave up hope after years of war, death and poverty, losing faith in their shaky government. “We’ve got a president called Hamid Karzai who has done nothing for Afghan people,” fumes Shuja Halimi, a Kabul resident with three children. Eight years on after the US invasion, Afghanistan is so destitute and undeveloped that most inhabitants have no central heating, electricity or running water. According to aid agencies, violence has surged over the last three years with more than 2,500 people killed until the first six months of 2008. Afghan smugglers say the number of “clients” is up 60 percent from last year and business is so thriving that they even turned away some customers. “It’s out of my power to deal with the demand,” one smuggler in Kabul told the NY Times. The most common route for smuggling Afghans is by road from Iran via Turkey to Greece and costs around $16,000. Once in Europe, Afghans apply for asylum most often in the United Kingdom, Greece and Italy. Last year, about 18,000 Afghans applied for asylum in Europe, a figure nearly double the 2007 total. But immigration experts affirm that Afghans do not often find a better life outside their country. In France, for example, an immigration detention complex dubbed the Jungle is keeping about 600 Afghans in conditions that are “very, very bad,” said Jean-Philippe Chauzy of the International Organization for Migration in Geneva. Halimi, the Kabul father, has a personal experience. He was deported from the UK after a two-month journey across 12 countries, including Bulgaria, where he says he eluded gunfire at the border. He insists that while living conditions in Europe were awful, but not as bad as in Afghanistan. That’s precisely why many war-weary Afghans prefer the struggle abroad to the at home. But despite the struggle he endured, he is vowing to try again. A charter flight to Afghanistan deported Afghan immigrants yesterday, according to the newpaper Eleftherotypia. tvxs.gr reports that the number of deportees was 25. This was done in the frame of the deportations programme implemented by the ministry of interior, under which 55 Pakistanis were deported. The ministry leaks that these deportations flights will continue after agreements made with “various embassies”. tvxs.gr reports that the number of deportees was 25.